Join the Greater New York Chapter for a Night at the Theater on Thursday, July 12 for Hell: Paradise Found at the 59E59 Theaters. The show begins at 7:15 p.m. Written and directed by Seth Panitch, Associate Professor of Acting and Director of the MFA and Undergraduate Acting programs at Alabama, the show stars graduating and recently graduated students from the University's Department of Theatre and Dance, local professionals, and a nationally and internationally recognized AEA Guest Artist. The production runs at the 59E59 Theaters from July 10-22. 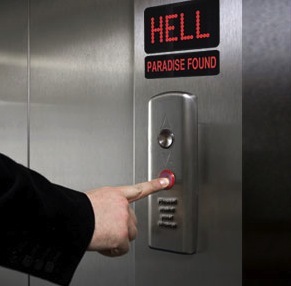 Hell: Paradise Found is a hilarious examination of recently deceased lawyer and all around schlemiel Simon Ackerman who suddenly finds himself desperate to get into Hell, which, God forbid, turns out to be the better place to both visit and spend Eternity. Struggling against the demons before him as well as the demons within, Simon encounters other proud denizens of Hell, including William Shakespeare, Frank Sinatra, Vlad the Impaler, and a chic, fashionable Mother Maria Theresa, among others. UANYC is hosting a talk-back session and reception with the cast in E:Bar on the theater's second floor following the performance.